A majority of the population have at some point experienced low back pain in their lifetimes. Although low back pain is recognized to result from numerous conditions or injuries on the lumbar spine, muscle strains such as a quadratus lumborum muscle strain, are believed to be a leading cause for the recognizable symptoms of pain and discomfort. 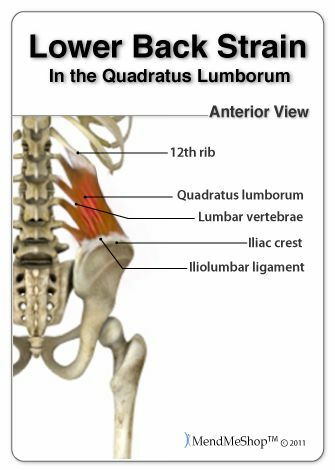 The quadratus lumborum muscle is a sizable muscle in the shape of a triangle, located deep on each respective side of the lower back. The role of the wide muscular tissue is to grant mobility to the lumbar spine in sequence for the torso to move laterally from side to side as well as extend and stabilize the lower spine to improve posture. When this muscle is strained or pulled, the symptoms can restrict movement on the lower back and since the muscular tissue is so extensive, recovery from this type of injury usually requires more time and patience to fully heal. When symptoms of back pain begin to develop during physical activity, the pain may contrast per individual, ranging from mild to severe together with limited mobility and a burning sensation on the muscles. Other symptoms include swelling and inflammation, followed by muscle soreness and weakness. The previous can be associated with injury or strain to the quadratus lumborum but these may often be confused with another condition that causes low back pain and similar symptoms. The facet joints are naturally aligned on the posterior side of the spinal column and their function is to connect each vertebra together but, with injury or degeneration, the spine can progressively misalign and add pressure to the joints. Significant low back pain and discomfort are the most common symptoms of this condition followed by loss of flexibility and mobility on the lumbar spine. The pain can radiate down into the buttocks and legs due to the swelling and inflammation surrounding the affected facet joints. If you’ve experienced any of the above symptoms, getting a diagnosis for your low back pain is your best option for determining which condition or injury has affected your lumbar spine’s health.